HTML pages are not always better than PDFs. In certain areas of application, PDF files are generally preferable. When it comes to allowing the user to print something or scrolling through a catalogue, PDF files have their advantages. However, there is the problem that search engines are having a hard time crawling through PDF files. Additionally, the readers sometimes don’t know how to react to this kind of content. There are a couple ways to upload and share PDFs, either on their website or through a third-party provider service like FlipbookPDF. How you end up tying in the PDF files is your decision. In this article, we want to give you some advice that is supposed to help you create successful PDFs for search engines and viewers alike. PDF files should never replace HTML websites since they rarely rank well for important keywords and it usually takes too long until the data has loaded. PDF files are larger than HTML files with the same content. However, when the PDFs are of high quality and contain properly optimised content, they will also be found well via Google. In the following, we will deal with the optimisation of PDFs for search engines. Creating PDF files in a text editor allows for the crawling of its data and thus the inclusion in the ranking. Search engines also have trouble reading images and graphics which is why it’s important that the text is actual text and not added as text on graphics. There are many good and comfortable text editors. HTML editors can be used as well. Recently, we have introduced you to HTML editors for Windows and for Mac OS X. Before saving your PDF, you should fill all important fields like title, author, subject and keywords. That maximizes the chances of Google crawling and ranking your resource. 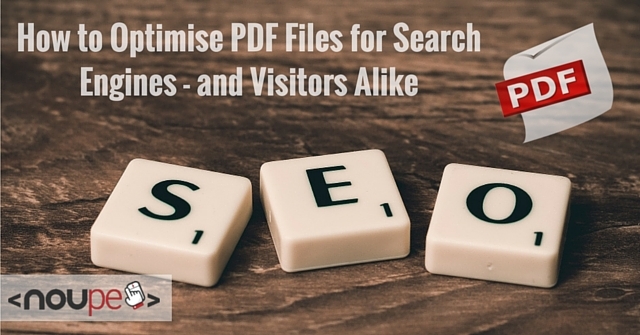 When creating your PDF, you should keep an eye on some simple SEO rules. Content should be written around the keywords that you want to have ranked. There is no difference to normal websites. 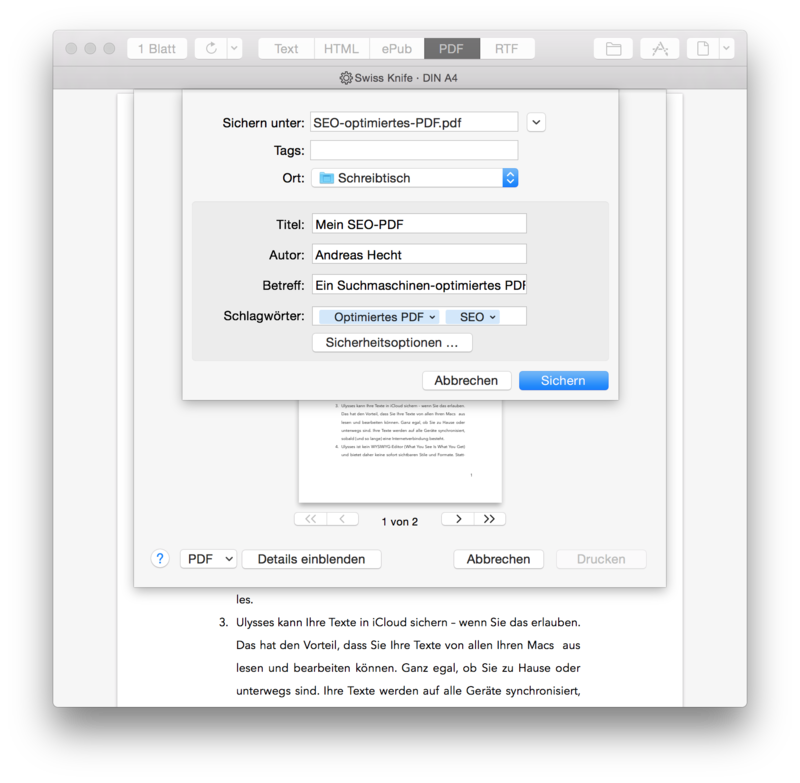 Also, the PDF should have a keyword-related file name as well as keyword-related titles and subtitles. The SEO rule that prevents you from duplicating content also applies for PDF data, so avoid to duplicate content in HTML and PDF files. Search engines are not able to tell the difference and thus aren’t able to know which of the two resources is important for the ranking. Images and graphics should always be optimized before being integrated into a PDF. The image material should be cut to the correct, sufficient size and optimized for use on the web. Here, programs like Photoshop or Gimp can be used. Other options are online tools such as TinyPNG and JPEGmini. Another important aspect is the correct completion of the Alt and Title tags of the pictures. This enables the search engines to recognize and index your photos in the PDF. Alt and Title tags should accurately describe what can be seen on the graphic and what it is used for. To generate more traffic to the PDF and increase the credibility (and the rank) in search engines, you should create a couple internal links to the PDF. The PDF itself should also link back to relevant pages of your website so that the readers can easily navigate between website and PDF. A descriptive title and a good file name that contains keywords are another important parameter. Just like the title of an HTML page, the topic of the document should be evident from the title. With a descriptive title, you make sure that the PDF doesn’t show up as in the following and that nobody besides you knows the content. 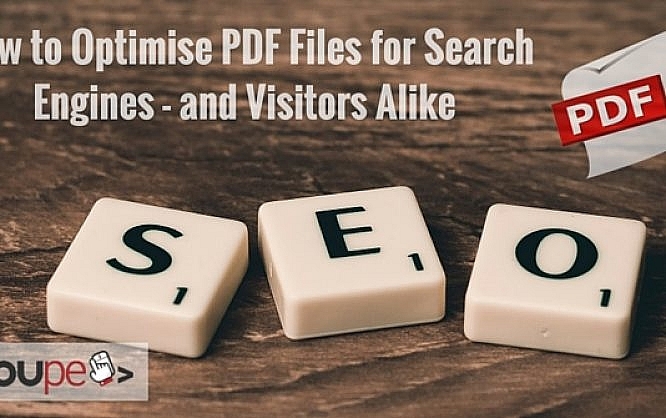 After optimising your PDFs for search engines as good as possible, you can start polishing them for a positive user experience. First, work on the loading time of the document to prevent readers from cancelling the download prematurely. The document should also be found after the download and besides a clear file name, there is another way we can achieve this. Keeping the data size as small as possible is important. Chances of the download being cancelled are significantly lower when the file has been polished in that regard as it loads much faster. Thus, it is recommended to use as few graphics and images as possible and to tweak the used images before tying them into the PDF. Some users simply can not find downloaded data on their PC. Opening the PDF in a new tab instead of downloading it seems to be a good solution. As soon as the file has opened in the new tab, the user can download it from there. As the browser doesn’t need to be left in order to read the file, your chances of the website being used in the future rise. A consistent branding of your PDF files is the key to more successful PDFs. The use of your corporate design is mandatory in the creation of PDFs as visitors can instantly see where the downloaded file is from. In addition, the file gains visual credibility in comparison to a normal PDF. Interactive and easily navigable PDFs satisfy the readers. Simply create a PDF in the way you would want such a file to be. When you can search through a PDF or when it offers a working forward and backward navigation, users are more likely to read the whole document. Perfectly designed PDFs can also increase the reputation of a website as readers reward effort. Make sure your PDF files are write-protected. When you miss out on that, anyone can edit your PDF data, add own links or upload it on their own website. Without write-protection, anyone can use your work and pretend it was theirs. People can learn how to edit a PDF pretty easily nowadays. Sometimes PDFs are the best way of giving information to your target group. 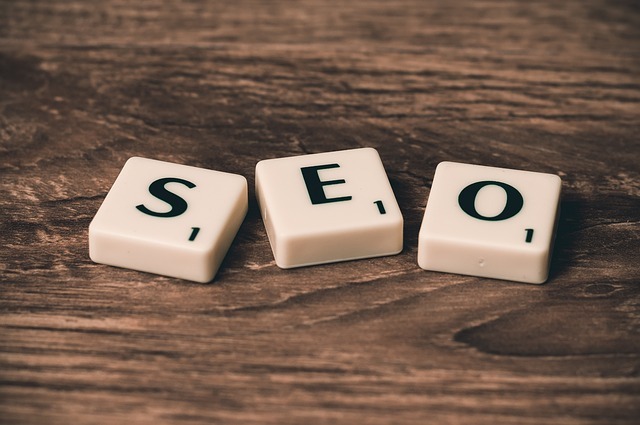 When you pay attention to the above-mentioned simple SEO and usability rules, the chance of your PDFs being ranked higher and being more popular increases. End users are rather not used to files like PDFs as website content, since it gives that subcutaneous feeling of an attached, unexpected content (like popups and some add-ons). I would suggest embedding pdf files directly to a container, rather than forcing the user to either download or open in a new browser tab. HTML5 tag handles that pretty well.